"These sandwiches are quick, easy, and always a hit. They can be served at receptions, baby showers, Bible studies, or tailgate parties! I have made large quantities and they have always turned out. Sandwiches can be made up in advance and stored in refrigerator until ready to bake. Try them and enjoy!" Place a rack into lower half of oven and preheat oven to 400 degrees F (200 degrees C). Arrange bottom halves of Hawaiian rolls on a baking sheet. 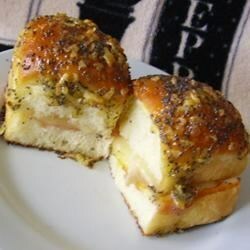 Place a half slice each of ham, Swiss cheese, smoked turkey, and provolone cheese onto each roll bottom. Place top halves onto each bottom to make sandwiches. Melt butter in a saucepan over low heat and stir in sugar, dried onion flakes, poppy seeds, and honey mustard until mixture is smoothly combined, creamy, and the sugar has dissolved, about 2 minutes; brush over the tops of each sandwich. Bake sandwiches on the preheated oven's lower rack until tops are golden brown and fillings are hot, about 15 minutes. They were good, but you MUST watch them closely in over to avoid burning. Wow....I could drink this sauce. I made it in the microwave. I didn't have honey mustard, so I just added some honey and some mustard to the rest of the ingredients..